M48 OPS Tactical Belt Pouch - Black | BUDK.com - Knives & Swords At The Lowest Prices! 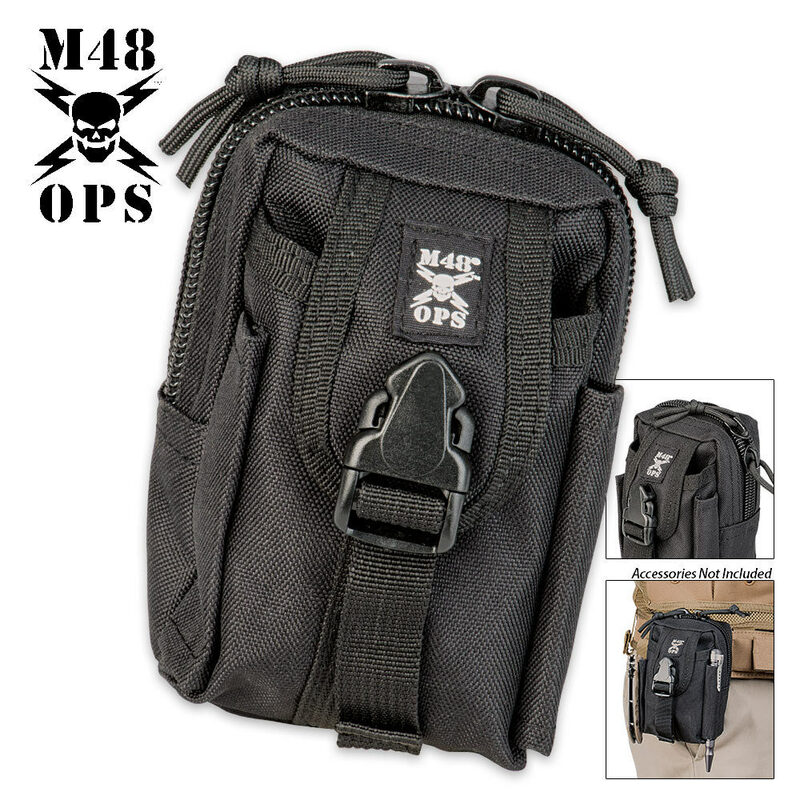 Pack all your small tactical gear into this top quality tactical belt pouch from M48 OPS. 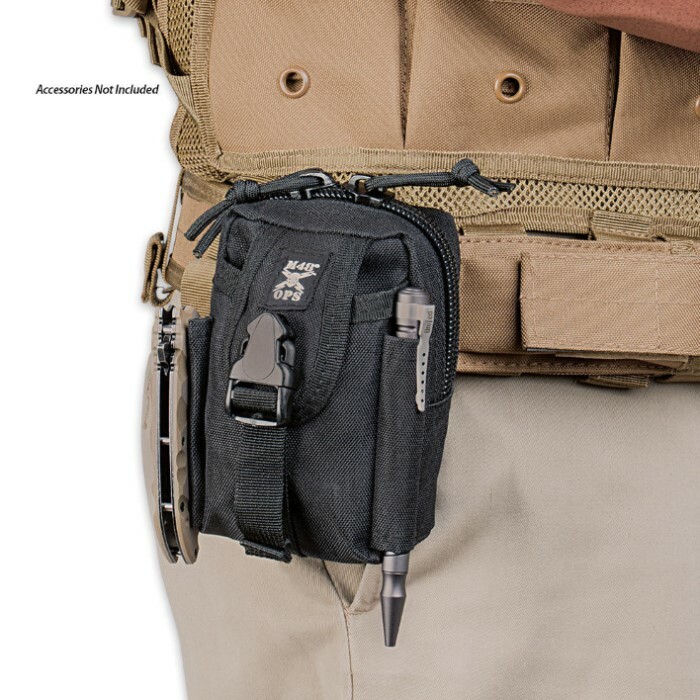 This tactical belt pouch offers heavy duty but lightweight construction that won't weigh you down. The pouch features two interior pockets and an outer pocket that is perfect for a cell phone. A heavy duty zipper and buckle keeps it tightly closed. 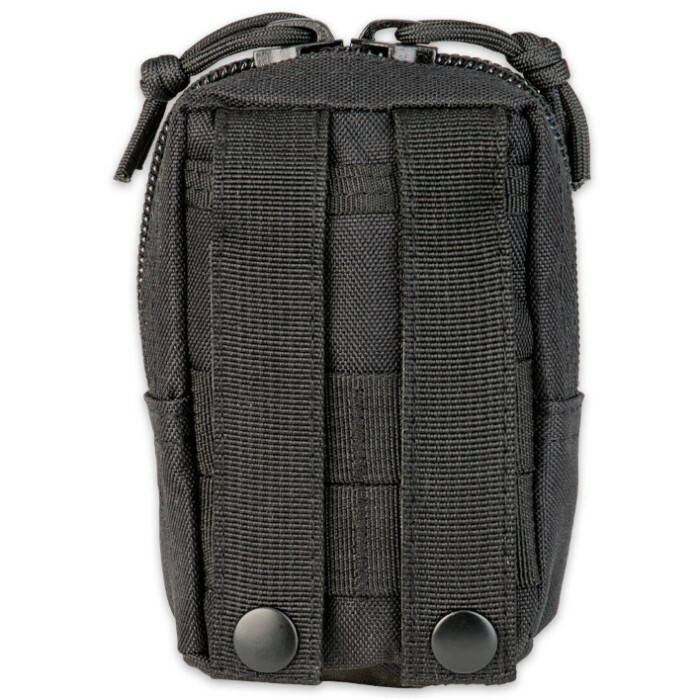 The belt pouch also features MOLLE webbing for additional attachments and a pen holder on either side. Two strong, straps with snap closures will keep the pouch securely in place on your belt. When you need to carry those small but important items with you, make sure they're safe and within easy reach. I have used this pouch on my belt everyday for the last few months now to carry the following items with me: Cellphone Pen Notepad CAT Tourniquet Sharpie Shears & Gloves. Whether I'm at work, or I'm off duty out shopping, I have some of my most important gear on me at all times. My only negative comment about the pouch, for which I deducted one star, is the cellphone clasp is difficult to operate and get used to. I would have much preferred a Velcro or simple snap option for ease of use. Other than that, I highly recommend this pouch. Party in the BACK !!! Cell phone in the front . Small snubbie 22lr revolver in the back !!! I carry a lot of pocket clutter and I found I kept leaving handy things at home so I bought one of these to keep everything in one place. It has held up great for daily carry. I keep a mini flashlight, lighter, full sized gerber multitool pliers, allen wrench set, portable usb charger, and mini screwdriver set inside and everything has room to fit in neatly and be easily accessed. The outer pocket is the perfect size for a galaxy s4 with a moderately thick case. I work door at a couple of bars so I also keep wound seal, gloves, and some bandages in one of the inner pockets, and a tactical pen on the outer loop so it is in easy reach, just in case. I'd give it 5 stars but as one of the other ratings said, the buttons on the belt straps don't seem like they can take a lot of abuse. I just keep them fastened and undo my belt to remove the pouch to avoid the stress fastening and unfastening them would do, and they have held securely. We bought these in both black and od green. We are using them for a small edc pouch inside a larger bag for various small items. The quality is good, the snaps are a little loose after a few tries. For what we are using them for they work great lots of compartments and zippers work great. For a molle attachment I'm not so sure the snaps would last on the outside of a bag if be removed often.